This sword belongs to Jo saku ranking. Blade length : 73.9 cm or 29.1 inches. 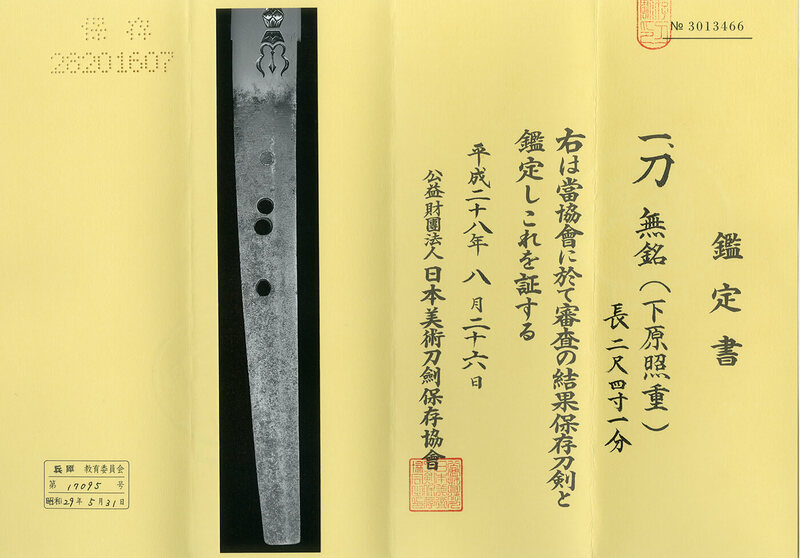 Width at the Kissaki : 2.15 cm or 0.85 inches. Era : Early Edo period Kanei era. Shape : The blade is wide and thick with suitable curve and long Kissaki nice looking shape. and Kenmaki Ryu (A dragon swallowing to sword) are engraved on the other side. Jigane : Itame-hada well grained with Jinie attach. Ploshed well to take a look to the texture. Hamon : Niedeki Suguha with Komidare double Ha wild feeling temper line. from Muromachi Eisyo era and continued to Edo. and also Musashi Taro Yasukuni is well known sword maker in Edo Kanbun era. Terushige was working at the end of Muromachi period. The jigane is well grained item had and blackish jigane with dark hamon cut well sword. by him self. He passed away several years ago. We learned a lot from him. 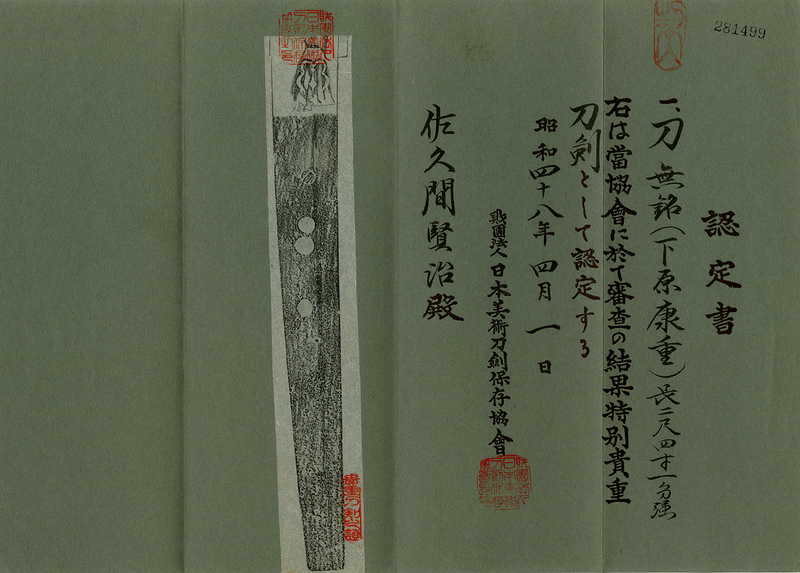 This sword is typical Shitahara Jigane and the engravings are also nice. Saya : Kawarinuri style Saya. Tsuba : The scape of birds passage are carved on round shape iron Tsuba. Menuki : Shishi-dog engraved on the copper plate. Kojiri : Autumn leaves are carved on brass plate.